Falkirk have bolstered their strike force with the signing of East Fife forward Nathan Austin, and extended the contract of John Baird. Austin has been signed for an undisclosed fee and loaned back to New Bayview for the rest of the season. "Nathan is a young, promising player who has an eye for goal," manager Peter Houston told the Falkirk website. "He's a player we're pleased to sign and is very much a large part of our plans for the future." Austin, 21, has scored 16 goals in 25 appearances in all competitions this season, while Baird has been at the Falkirk Stadium since January 2015. 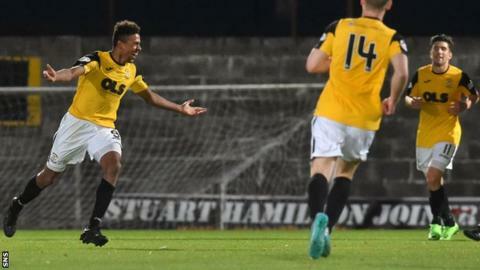 "It is important that Nathan goes back to East Fife until the end of the season to continue his development and hopefully continue his fantastic scoring run," added Houston.